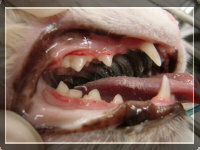 Dental disease is a common and often overlooked problem in dogs and cats. While cavities represent the most common dental disease of humans, our small animal companions are more frequently bothered by gingivitis, tartar build-up, and periodontal disease. 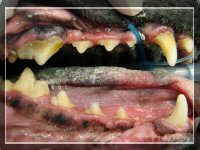 Left untreated tartar accumulation can lead to irritation, infection and tooth loss. Infection of the mouth can also spread and cause tonsillitis, and pharyngitis (sore throat). If the infection gets into the blood stream it can also be carried to other parts of the body. Kidney and heart valve infections usually begin from the mouth. Genetics – individual body chemistry can play a role in how fast tartar accumulates in the mouth. Some individuals require yearly cleanings while others may only need one or two in a lifetime. Diet – dry food is better than canned for dental health because it sticks to the teeth less, in addition the mechanical crunching action does work some to keep plaque from building up. 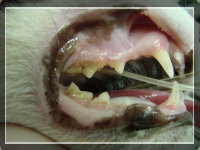 In some cases the veterinarian may suggest a dental cleaning for your pet. A dental cleaning requires complete cooperation of the patient so that the tartar can be removed, and any teeth extracted if necessary. Anesthesia is therefore required. Pre-anesthetic blood work is required before any dental/anesthetic procedure. This allows the veterinarian to know how your pet’s organ systems are working, and to be able to choose the safest possible anesthetics for the procedure. Although there is always a degree of risk with any anesthetic procedure, be aware that delaying proper dental care may ultimately do more damage to compromise your pet’s health. Scaling removes the tarter above and below the gum line with ultrasonic equipment. The tartar under the gum line must be removed for a cleaning to be most effective. Polishing smoothes the surface of the teeth to discourage future accumulation of bacteria that causes plaque and tartar. Flushing removes dislodged tartar and bacteria from the mouth. Antibiotic therapy for many patients is required due to current infection. 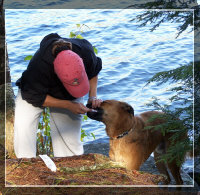 Veterinary dentistry is currently undergoing tremendous modernization. The days of cleaning teeth by removing tartar from above the gum line and pulling out loose teeth are gone. 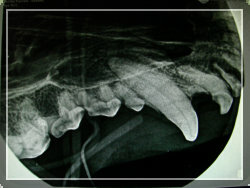 Providing quality dental care to your pet is impossible without dental radiographs. Both our clients and our practice standards require a higher level of care for your pet and dental radiology is a vital part of those standards. Most dental disease lies underneath the gums and cannot be seen without radiographs. Since treatment decisions are based on x-rays, the better the radiographs, the more accurate the diagnosis. Dental radiography allows for diagnosis of certain diseases, helps plan for the appropriate treatment, and monitors the success of the therapy. A newer development in dental radiography is the availability of digital radiology systems. Groton City Animal Hospital takes the oral and dental health of your pet very seriously and believes that dental care is an important piece of your pet's overall health. To better care for your pet's teeth, we have invested in a modern digital dental radiology machine. There are many advantages to digital dental radiology. The quality of digital radiographs is much better than x-rays produced by a traditional machine. Because digital radiographs are so much better than traditional x-rays, fewer images of the teeth are needed in order to make an accurate diagnosis. 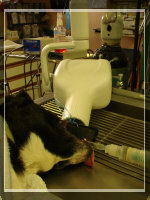 As a result, your pet receives less anesthesia when using digital radiograhs. 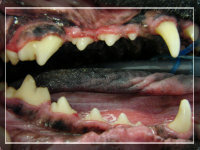 Seek regular veterinary care and have teeth cleaned when advised. If brushing is not an option for you or your pet there are some mouth rinses/gels made especially for pets. Although not as effective as brushing these products can help increase the time between dental cleanings if used consistently. Lastly there are some dental care diets available as well as chew toys/treats such as bully sticks. Just imagine how much plaque and tarter would build-up on your teeth if you didn’t brush for a week, a month, a year, or ten years? Left untreated, tartar can lead to the build-up of bacteria leading to decay, and tooth loss. Bacteria may also spread to internal organs such as the heart, kidney or liver resulting in serious health issues for your pet. The best defense against dental disease – tooth brushing. Unfortunately this is one trick that you probably won’t be able to teach Fluffy to do on her own, but take heart, brushing your pet’s teeth is not as hard as you might think. Ideally dental care should begin when your pet is a puppy or kitten when other training is taking place. Also, it is important to start with a clean slate. If the plaque that builds up on your pet’s teeth is not removed within 24-36 hours after eating, it hardens and becomes tartar. Once this happens it takes a professional cleaning to remove it. We discourage the use of metal tooth scalers. Although you can purchase these instruments over the counter and they do remove tartar, the damage they create may be worse than the tartar. Scalers can cause damage to gums if not used correctly, then also create grooves in the enamel of the tooth which may promote the build-up of plaque by providing a space for bacteria to grow in. During a professional cleaning a scraper is used, but it is followed up by polishing the grooves out of the teeth. Veterinarians recommend brushing teeth once daily using a soft bristled brush and toothpaste made for pets. Human toothpaste is not meant to be swallowed and can be dangerous to pets. Start by letting your pet lick the toothpaste off your finger. Next substitute a toothbrush for your finger. Hold the brush at a 45 degree angle and try for circular motions around the gumline. The goal is to get to the outside of his teeth. Don’t worry about brushing the inside surface of the teeth. For pets that do not want to cooperate, there are some alternatives to consider. Dental wipes and rinses act like mouthwash to keep bacteria levels lower and promotefresh breath. Dental diets- certain diets (like Purina Dental Health) are specially formulated to fight plaque and tartar as well as scrape plaque from the teeth. If interested, please ask us about these dental products.